Exhibitors! Write us for Free Copies of Current and Past Editins. You pay freight only. 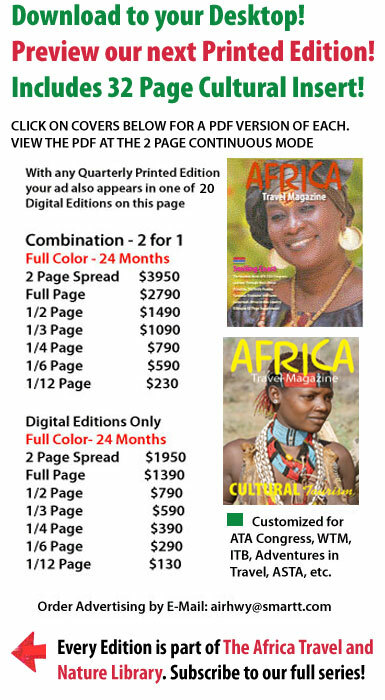 Our two issue for one combination gives you the advantages of both PRINT and DIGITAL Edition Advertisements. GLOBAL REACH online plus KEY MARKET IMPACT in Print. A 15 Year Succsss Story as Voice of the Africa Travel Association Worldwide covering all of Africa. WINNERS: ATA Founders Award, TTB Annual Awards, United States Film Festival Creative Excellence Awards - and more. INTERNET: #1 on Google and Yahoo for travel, trade and tourism marketing and other Africa topics. TRAVEL SERVICES: Midroc Technology Group, Tour Operators, Travel Agencies, Auto Rental and Services from Africa and North America. 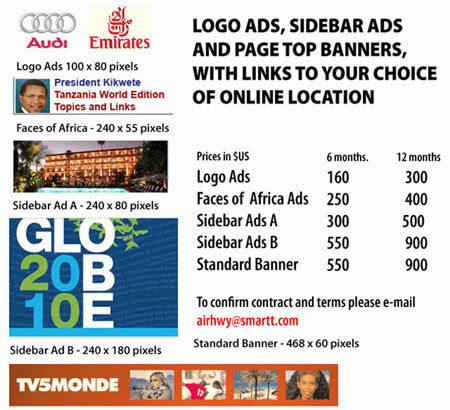 How can we help you to raise your profile and increase your African Travel Sales? Africa Travel Magazine is the international magazine devoted to travel to Africa. Published in Canada since 1995, Africa Travel Magazine are aiming to reach a lucrative audience of regular travelers, then Africa Travel Magazine should be an important part of your marketing mix.